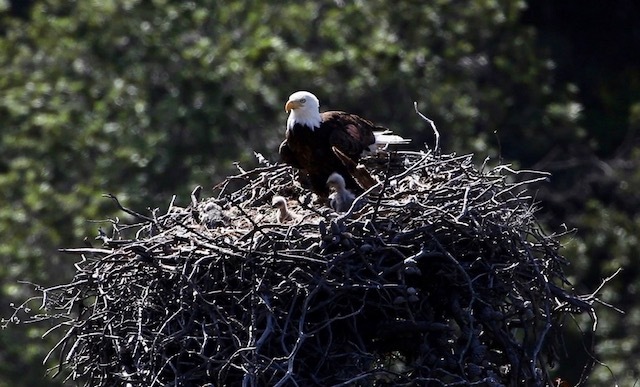 Bald eagles are nesting now, and you can watch them raise their young! 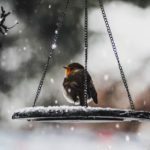 HomeBlogEveryday EcologyWhy You Should Check Out These Eagle Cams! Bald eagle chicks in nest. Photo by Skeeze on Pixabay.
? How cool is it to be able to watch birds in their nests?! “Nest cams” or “Bird cams” are cameras fixed at known nest locations that stream video of birds’ nests in real time. 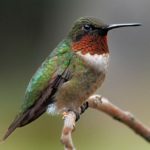 There are many nest cams out there that let you observe the family life of birds (and other animals) from hummingbirds to penguins, owls and eagles. Some bird cams use infrared light to provide images 24/7. These cameras can provide incredible insight (and entertainment)! My aunt Sal introduced me to the Hanover PA Bald Eagle cam last year, and I got hooked!
? Eagles are nesting right now in the U.S. According to the National Eagle Center, eagles lay their eggs as early as mid-February in the northern U.S., and earlier in warmer climates. They tend to use the same nest year after year, rebuilding and adding to it. Eagle nests can get huge. The average size is 5 feet wide and 4 feet deep. 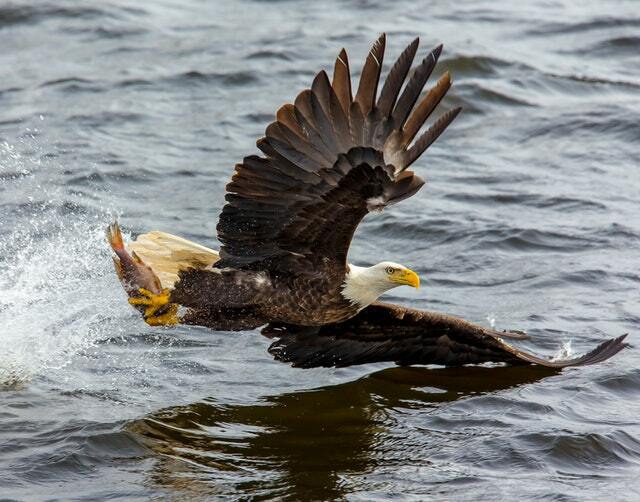 Bald eagle catching a fish. Photo by Wayne Christensen on Pexels.
? 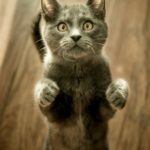 Why care about nest cams? Having the bird’s eye view of a nest is an amazing experience. You gain insights into the daily life of birds working to raise the next generation. 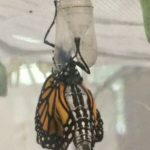 You learn about how pairs rely on each other, about what and how much they and their babies eat, and about how the babies progress from being helpless to learning to fly. If you’re lucky, you get to see the babies when they make the leap out of the nest! Watching eagle cams last year gave me a sense of how hard young birds have to work to go from being helpless wobblers to being strong enough to stand. Just imagine all the learning needed to be able to fly and hunt! As the babies grow, you see how parents transition from active feeding to letting the young learn to eat on their own. 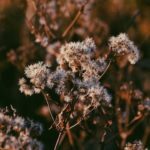 A warning: you’ll see brutal aspects of the cycles of life as well as tender ones. Last year, I turned the camera off more than once when prey was brought back to the nest alive.
? Where can you find eagle cams? 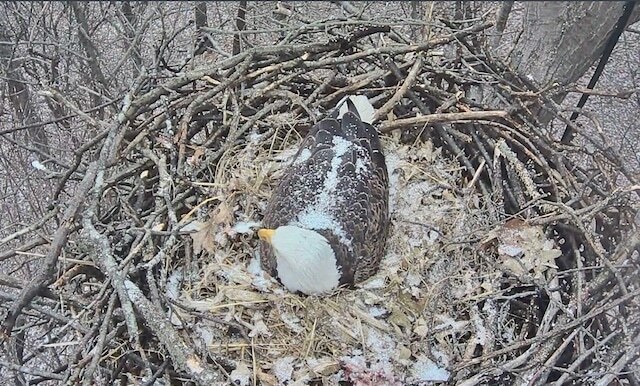 Links to some current eagle cams are below. It’s also fun to read through the discussion threads toward the bottom of each web cam page. There’s usually a moderator for each camera, and you can learn about the biology and ecology of the birds from these discussions.
? Hanover PA Eagle Cam. These Pennsylvania eagles have been freshening up the nest and are expected to lay their eggs any day now. In the Channel Islands, Santa Cruz CA. The pair is sitting on 3 eggs. The moderator for this nest cam expects that the first chick will hatch around March 11.
? Decorah Iowa Eagle Cam. This pair is still fixing up their nest in preparation for laying eggs.
? Two Harbors Bald Eagle Cam. This nest is right above the water on Catalina Island, California and is occupied by a pair with 2 eggs. 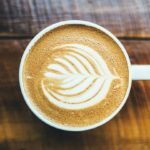 If you’re a nest cam watcher, what are some interesting things you’ve learned? What has surprised you? Thanks for the webcam info Anne, I will enjoy checking out these birds. Thanks for your comment. Enjoy the webcams! This is just time time of year to post this. 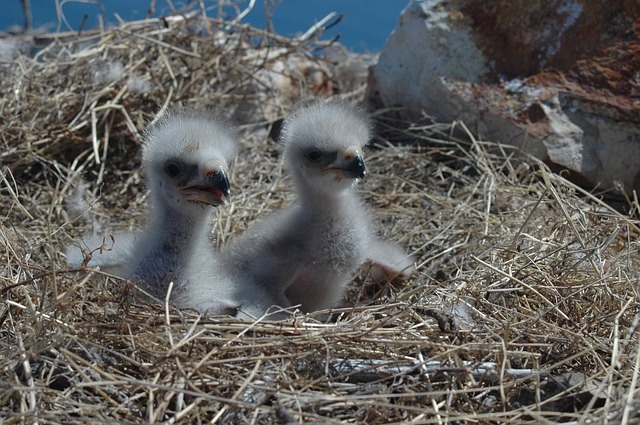 One will be able to watch the process from nest building/repair , to egg laying, to eaglet rearing, to fledging. Hi Nancy! Agreed! It’s such a fun process to watch, and a great opportunity to learn more about the birds. Thanks for your comment, and enjoy!